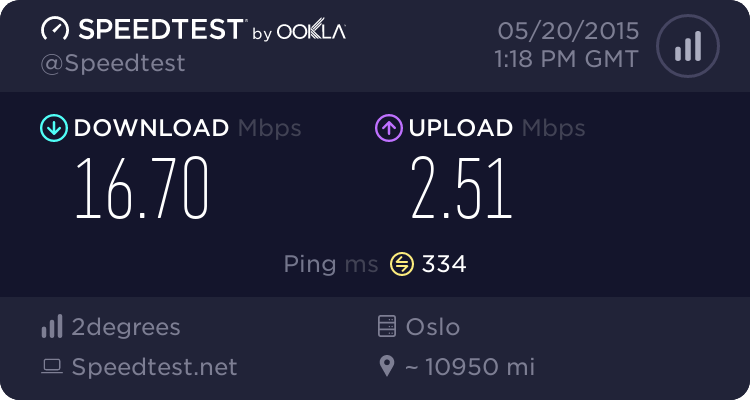 Which provider has good international speeds? 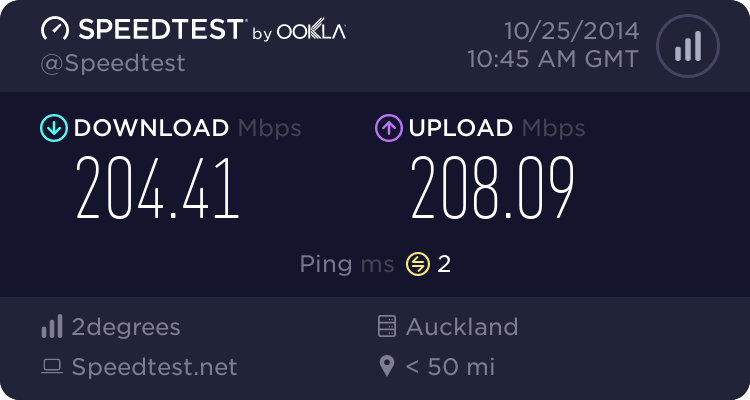 Forums › New Zealand Broadband › Which provider has good international speeds? I am currently with Orcon, VDSL. Dying to switch, not sure how long the process actually takes, but I am in 200Mbps area. Looks like options are Vodafone & Snap for full 200 Mbps. Looks like Vodafone is shaping their traffic though. Is there a benchmark of what providers actually give you? 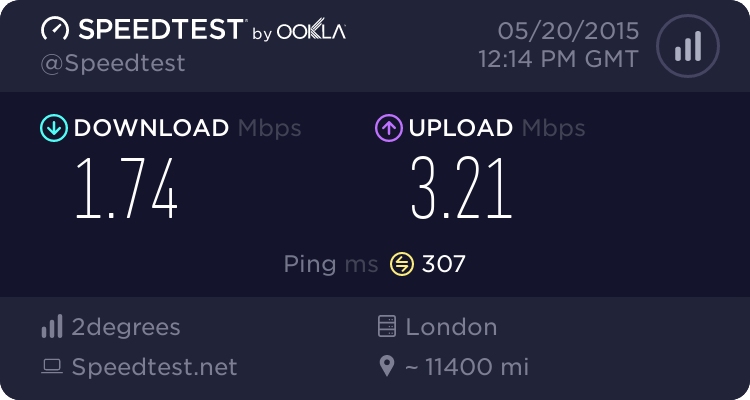 Perhaps you can post what you are using and speeds to San Francisco & London? I realize I will never get speeds, but just want to make a good decision here. 100 Mbps will work for me as well. You want 100Mbp/s international on consumer grade internet to San Francisco & London? johnr: You want 100Mbp/s international on consumer grade internet to San Francisco & London? > I realize I will never get speeds, but just want to make a good decision here. Speeds to USA will be hit and miss due to peering arrangements between providers within the USA. Speeds to London (or anywhere else on the other side of the world) will always be poor due to ping times and the way TCP works. Also some other things to consider between Vodafone and Snap. Vodafone run cache servers (transparent proxy). And there have been previous complaints about their routing. From people saying this causes poor ping times to some game servers. Snap don't have any cache servers. And better routing. Snap have IPv6. Vodafone give you discounts if you have a Vodafone account cellphone. And often sky / netflix discounts / offers. Most people won't notice the caching or the routing. But there are a few which this causes big problems for. Mentioning all of this because this is a geek site after all. And Yes im on Snap UFB in Auckland. My router is a Ubiquity Edge Router Lite. Snap don't have any cache servers. Citation needed. My understanding is snap do run a transparent proxy. Whether all http traffic runs thorough it or just some i'm not sure. I actually noticed that at work. The test was done way too fast. yeah it's kind of annoying, because it's useful to test international speeds to various locations. it tends to behave a lot better with the US than Europe.. And there are some contributing factors.. About 4 years ago I could get 16 megabit on UK speedtest.net on ADSL by proxying my traffic. Which is one way to improve the performance..
TCP/IP can actually ramp up quicker than most people realise - on a good connection you should be able to get 200 megabit within seconds..
but seconds at 200 megabit is still 60mb+ ..
one thing that seem to be common is file transfers going faster ... than cutting out and going slower, due to suddenly getting more errors when trying to go too fast..
and so there's "streaming performance" ie - can you stream at 10 megabit, raw performance which includes time taken to get up to speed. 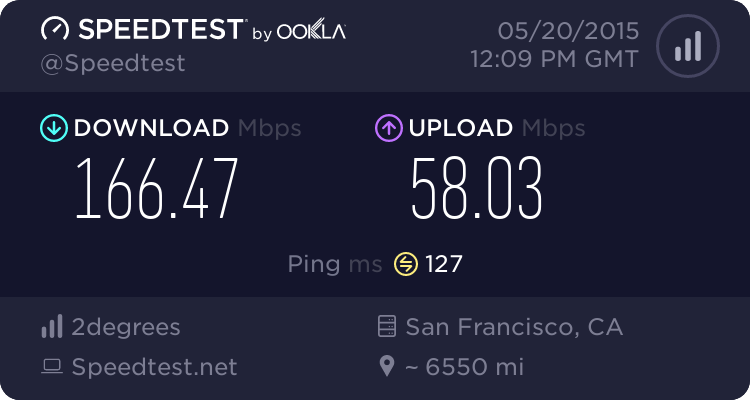 consistency of performance - which matters both for streaming and raw, sometimes one connection will go fast the next slow, and if you're lucky you'll get a good connection, and if unluckly you'll get a bad one. Which means you have to test single threaded downloads multiple times over. 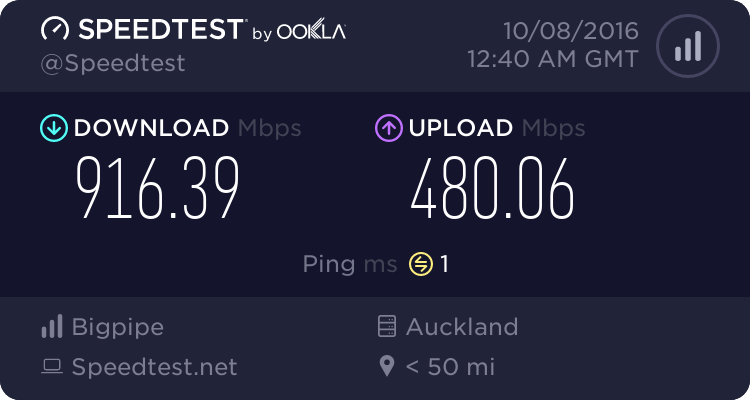 Streaming performance can struggle especially if it's real time when other users use the internet - so you can test downloading from the UK, and then start a download from a NZ server while it's downloading and see how much it struggles. If you really want to tempt fate you can do a concurrent upload too, or use a download accelerator to a NZ server. Raw performance, you have to decide if you want to abuse servers and use multiple concurrent connections and a download accelerator or do the friendly thing and use a single connection. If using a download accelerator you can watch out for some connections going much slower than others which matters more for streaming performance than raw performance if you habitually use download accelerators. if you want to consistently get good UK performance you can hire a VPS in the US and setup a proxy on it and bounce traffic through it - it'll accelerate the time it takes to get up to speed, get higher peak speeds, improve the chances of streaming working well, but it'll also mean you end up with a US IP address. And if you say want to buy another VPS and are using a proxy it'll often flag the connection as billing doesn't match browsing location. > And if you say want to buy another VPS and are using a proxy it'll often flag the connection as billing doesn't match browsing location. What if I get NZ VPS? Wouldn't they be serving 'business grade' internet? dzh: > And if you say want to buy another VPS and are using a proxy it'll often flag the connection as billing doesn't match browsing location. yeah there's heaps of fraud, if you tell them what you're doing they'll probably let it through manually. heaps of fraud with vps's. i don't think any of the nz vps places are wonderful for international performance with decent bandwidth pricing. 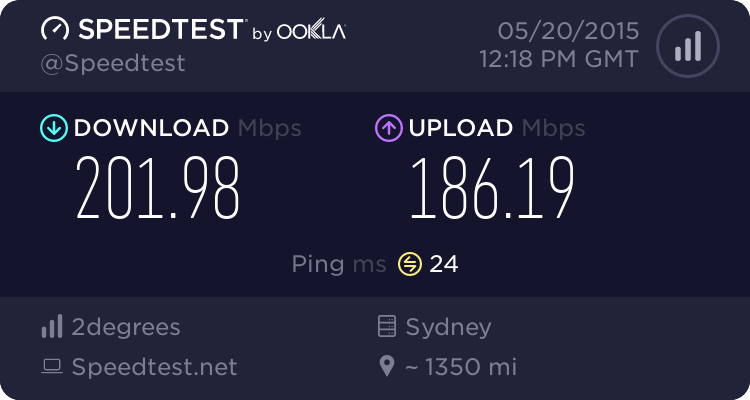 i wouldn't bother if I had UFB - just go to the US, and be aware of it... and choose somewhere you can get good speeds from. you can also improve performance by running traffic shaping on the other end and limiting the upload speed to your ip with the maximum connection speed your connection can do. and balance out multiple connections using sfq or fq_codel. if you're into that kind of thing it's pretty easy to do on linux. go with snap, their speeds are solid.